Now, y’all know I don’t do restaurant reviews. Originally, it was because it wouldn’t be fair, me working in a local restaurant and all, to review other local restaurants–I could hardly be considered to be an unbiased taster. And, there is the fact that, while I eat out often enough, especially at places I like, to be able to sample reasonably large chunks of the menu and also to get a feel on how the service is on different nights, I just don’t want to be a restaurant reviewer. It isn’t my bag–I love to cook, write about food and teach folks serious culinary techniques, not write critical pieces about local eateries where not only am I known to all and sundry, but I am friends with most of the folks who run these places. I don’t want to cause hurt feelings or upset anyone–if I had any complaints, I would never put them in a review–I usually would just talk to the folks at the restaurant, but still–I could step on some toes and I don’t want to do that. I like the restaurant folks here in Athens too much to do that. So, yeah, you get the picture. I don’t do restaurant reviews, and never intended to do them in this blog. I love me some good, slow-cooked smoked barbecue, and there is a nice place that just opened up here in town where they do it right. It’s called Kiser’s BBQ Shack, and it is located at 1002 East State Street–inside the Market On State. The decor is simple, with a sweet country-style mural depicting the bank of the Hocking River as it winds through Athens, and booths constructed like park-benches or porch swings, to carry on that picnic on the riverbank, park-like feel. In the front, near the counter where you place your orders, there are actual park benches for folks to wait for their to-go orders: a regular-sized one and a little one for the kids. Kat loves that bench, and insists on sitting there while we wait for our order to come up, even if we are going to eat in the restaurant. The menu is straightforward and to the point: there is meat, meat, meat and meat. So, I will say this up front–vegetarians will probably not be dining here very often. If a vegetarian does happen to wander in with a meat-loving friend, I have to say the coleslaw is really good and the potato salad is pretty good (though it can’t hold a candle to my Mamma’s at least, when she feels like making it), but vegetarians, beware of the delectable stewed beans–they have lots of local smoked sausage in them. On the other hand, the hand-cut , fried in peanut oil rench fries are the earthy essence of a potato, so that will make up for it, and they use local vegetables in their salads and make a mean home-made ranch dressing. But let’s go back to the meat, because that is really what a barbecue restaurant is all about. Every day, you have your choice of dry or wet ribs, (dry ribs are rubbed with spices and smoked, then served with sauce on the side, wet ribs are smoked with several brushings of barbecue sauce and are served drippy with the stuff), chopped pork, smoked chicken (by the half or the whole) and hot smoked Italian sausages. Each of these meats comes with your choice of three sauces–my favorite is the sweet and spicy. I have to tell you that the first time I tried the sauce, I wasn’t sure. The first taste that hits is the sweet. Then, the sour comes up from behind, bringing with it a tinge of cinnamon, and just when I was thinking to myself, “All right, people, where is that spicy you were talking about,” chili heat overtakes the tongue, and the tastes start tingling and dancing around in the mouth, doing a merry two-step with the amazing savor of rich, smokey meat. After that, I was hooked. Now, the ribs are delicious. Zak can attest to that, since he eats them every chance he gets. They are meaty and tender and juicy, with just the right ratio of spice and sauce to compliment the meat without covering it. And the chopped pork is wonderful–a pork barbecue sandwich messy with sauce and slaw is one of my favorite things in the world. And the chicken is mighty fine–some of the juiciest, sweetest chicken you can imagine–and the truth is, smoked chicken can be a dry and sad thing indeed. But not at Kiser’s–they do the birds proud. And the sausages are delicious. I love me some beef brisket. 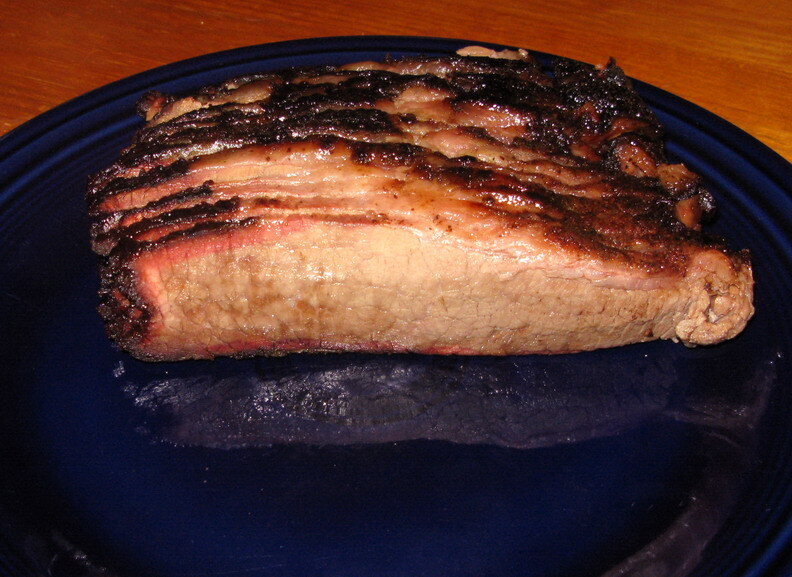 Cut into thick slices, Texas style–brisket is the best of the best as far as I am concerned. 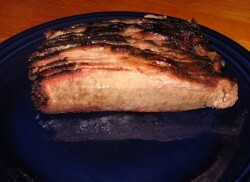 Tender, juicy and full of the very nature of cow, I eat brisket sans sauce and with reverence. Anyway, it was there that I was inducted into the church of brisket by an authentic Texas Barbecue Queen–she knew how to cook it all low and slow, and she made a convert for life. I’ve ever since been chasing the barbecue. Kiser’s also runs specials, like their beer-soaked smoked bratwursts, served on a bun with sauteed onions and peppers and whatever barbecue sauce you fancy. Now that was a good one–I was supposed to share that with Zak, but I think he only got one bite. Oh, and their beans. I mentioned them before, but I want to talk about them more in depth. These are like no barbecued or baked beans you have ever had before. For one thing, they use a mixture of navy, black, kidney and pinto beans in their recipe, which flies right in the face of tradition. And they are flavored with lots of spices, including a bit of cinnamon and chili pepper. There’s a good amount of sweetness to the beans, but they are also redolent of smoke courtesy of the Italian sausage slices cooked in them, and there is a tang of vinegar to make a graceful top note in the melange of flavors. 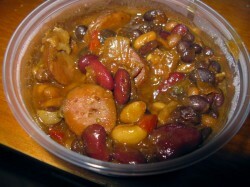 My favorite thing about them, though, is the clever use of raisins, which are cooked along with the beans and sausage. They simmer long enough to soften and at first, they look just like a bean, but then you bite into them and you get a burst of sweetness and it is like, “What is this honey-like thing I am eating?” And then you realize it is a raisin and it works perfectly in the dish and you just want to take your hat off to the chef, but that would necessitate putting down your spoon, so you just keep eating. I also want to make mention of the fact that I have been told that they source their vegetables locally, as well as all of their sausages. Currently, their meats are not local, because the large amounts of very specific cuts are just not possible for them to purchase from local farmers at this time. However, this is one of the most ecologically conscious restaurants I have ever frequented, where they use biodegradable and compostible utensils and serving ware. The paper towels are recycled, and they use nearly indestructible metal baking pans to serve their dine-in guests instead of plastic ones that can be subject to many mishaps in the kitchen and which will easily find their way into a landfill. The restaurant is open from Monday to Saturday 11 am to 9 pm, and Sunday noon to 6 pm for both dine in and carry out. They also deliver–you can call them at 595-RIBS and place an order, and they will cheerfully bring it to your door. I know, because our house was their first delivery. Now, I have to stop writing, because I am about to start fasting for a medical procedure and I don’t want to be torturing myself with thoughts of all the barbecue I am not currently eating, but could be. Otherwise, I could probably go on and on and on about the beautiful food offered at Kiser’s. Wow, you know I had wanted to visit Athens when you were working at Salaam, but sadly missed the chance. This sounds so very different, but almost as good. Those beans look fantastic! BBQ really is one of the best ways to indulge in an occassional meat binge. With a nice tall glass of cold beer to wash it down with, of course. I am Sean Kiser’s father & co-owner of Kiser’s BBQ Shack. Wanted to thank you for your kind words & endorsement of the “Shack”. I AM biased & happen to think that it is some of the best BBQ I have eaten. I live in the Chicago area & would love to be able to spread the product up here. Again – many thanaks !! Oh man… Why did I just read this? I’m gonna be hankering for BBQ for the next six months now! Plus, your description of the establishment makes it sound like this li’l place I used to go to with my dad.